The Arum Lily Urn Table Lamp by Jenny Worrall is a hand made glass table lamp, decorated with Arum Lilies on a distressed green gold background and supplied with an almond pleated shade. 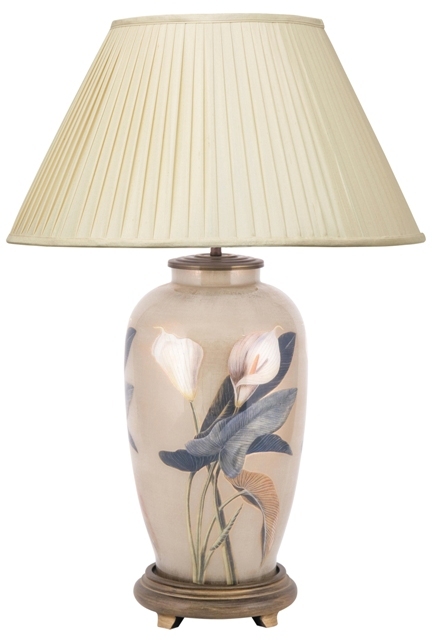 The Arum Lily Urn Table Lamp From Jenny Worrall Is A Beautiful Handblown Glass Table Lamp, Featuring Lifelike Arum Lilies On A Distressed Green Gold Background. The Jenny Worrall Arum Lily Table Lamp Sits Upon A Black Gold Resin Plinth And Is Supplied With A 20" Almond Knife Pleat Silk Shade.